Book 2 nights at our low off-season rate of $549/night, and the next TWO NIGHTS ARE FREE! Valid for stays until June 12th 2019-- Excluding Valentines Day Week, Spring Break and holiday weeks/weekends. Why crowd 12 people into a 2,000 square feet when you can have over 5000 square feet, 3 floors, a private hot tub, basketball arcade, pool and ping pong tables all within a short 3 minute stroll the beach? The Admiral House has been one of the most popular vacation rentals on the peninsula for since 2006. Sleep up to 10 more people at First Mate (VRBO listing # 430955) just next door for a total of 26 people! 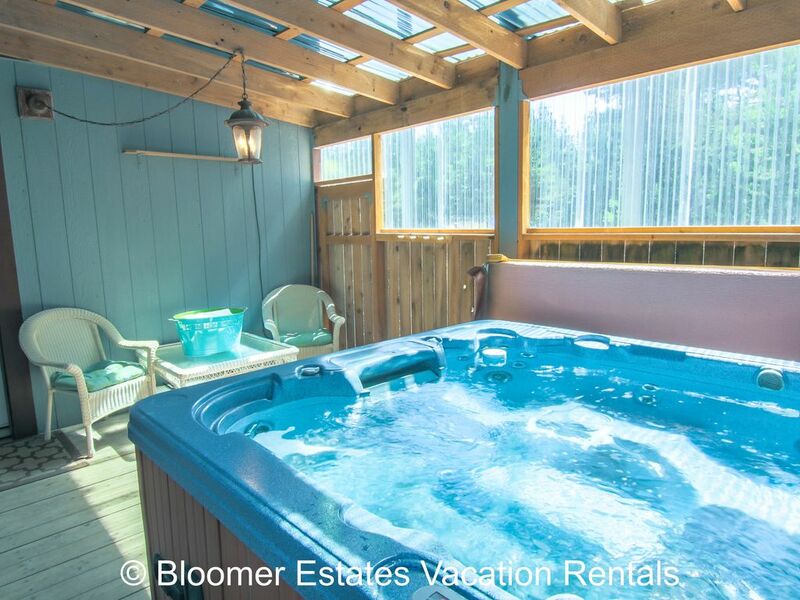 Both homes are managed by Bloomer Estates Vacation Rentals. This three-story, 5,000 square foot house that can accommodate up to three families with bedrooms on every floor! It has a lovely wrap-around decks on the second and third floors to enjoy barbecues or for relaxing with a great book and the sound of the ocean just a few yards to the West. The home has two recreation rooms with large Smart TVs/DVD/Cable, an extra-large slate Golden West pool table, Ping pong table, indoor basketball arcade game, plus a child’s play area stocked with toys. • Pet Friendly. Up to 2 well-behaved medium sized dogs maximum. Located in Klipsan Beach on the Ocean-side of Pacific Highway, the Admiral house is just opposite the Crowne Alley Pub. The Admiral House is just a 5 minute drive into both Long Beach and Ocean Park. The beach is only a 5 minute walk from the house on a public trail. Admiral is in a small community of just 4 or 5 houses, with a short (3 minute walk) shared path to the beach. Each bedroom has its own cadet heater, so guests can choose the temperature they like best. Large gas fireplace on 3rd floor living room. Table setting for 16: plates, bowls, water glasses, wine glasses, knifes, forks, spoons. We have plastic dishware for children. Open floor plan on 3rd floor with dining room, kitchen and living room. HD DVD player with two locations to rent RedBox DVDS. One at Jacks country store in Ocean Park, the other at Sids Market in Seaview. Game room with ping pong table, arcade basketball, toys and table for board games. Yard includes a firepit and horse shoe pit. Huge wrap around decks on levels 2 and 3 with propane barbecue and extra seating. Guests love the covered Hot tub to seat 6 people on first level. Beach towels included. Why crowd 14 people into a 2,000 square feet when you can have over 5000 square feet, 3 floors, a private hot tub, basketball arcade, pool and ping pong tables all within a short 3 minute stroll the beach? The Admiral House has been one of the most popular vacation rentals on the peninsula for since 2006. This three-story, 5,000 square foot house that can accommodate up to three families with bedrooms on every floor! It has a lovely wrap-around decks on the second and third floors to enjoy barbecues or for relaxing with a great book and the sound of the ocean just a few yards to the West. The home has brand NEW flooring on each level, interior paint, two recreation rooms with large SMART HDTVs/DVD/Cable, an extra-large slate Golden West pool table, Ping pong table, indoor basketball arcade game, plus a child’s play area stocked with toys. Wonderful and quiet. We really enjoyed the quick walk to the beach ! I would definitely rent from this host again. Completely chill and professional. Very nice rental that we have been using for many years. Wonderful stay. House accommodated us just fine. Lots of stairs so be aware if you have health issues. Carpeted areas could use up grading. House worked good for us (10 people). The location is great. Lots to do and explore and nice walk to the beach.Kitchen had everything you could need. The house shows signs of wear & tear and could use some maintenance and repair.Management company was very responsive through the whole process. Ocean Park is just 2 miles to the North. There is a lot on offer in Ocean Park. Adelaides café and bookstore is in a two-story historic building and serves latte's and ice cream by the scoop. Across the street is the Bay Ave Art Gallery and a new Antique store. Need a clam gun or a bicycle? Jacks Country department store stocks over 250,000 different items, including groceries. There is also a burger joint, antique store, pharmacy, large grocery store and pool hall/tavern.